Have you considered using evaporative cooling in Phoenix, AZ for your commercial space? Premier Industries, Inc.’s line of evaporative coolers is built to last like our industrial coolers, but without the C-channel frame and vibration isolation system. The commercial cooler is a lighter and more economical solution to your commercial cooling needs. Housing: Stainless steel grade 304, 18g, wet and dry sections. Special hat sections formed into cabinet bottom to assure maximum blower/motor support. Access panel: Full height removable panel to provide access to fan housing and discharge side of wet section. Removable top on wet section for access and pad replacement. Blower: Industrial grade blowers, FC, DWDI in horizontal (rear) discharge mode. Motor: Heavy duty, industrial grade, open face, drip proof sized to meet system requirements. Meanwhile, the wet section includes quality cooling media and water distribution systems. The electrical controls consist of a fused disconnect with manual off/on switch, a magnetic starter with thermal overload strips and a pump contactor. Remote controls (thermostat or manual switching) are available. All controls are optional. 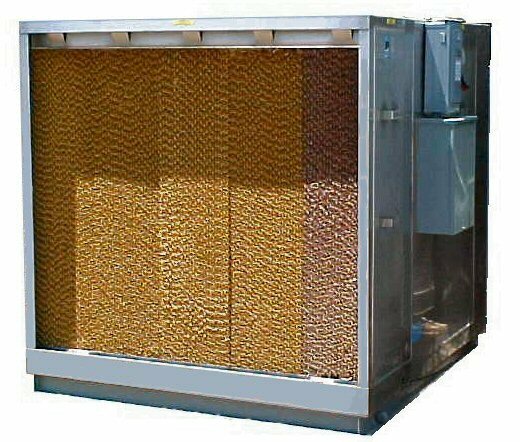 If you would like to inquire about our commercial evaporative coolers, please call 602-997-8754, or visit our Contact Us page.